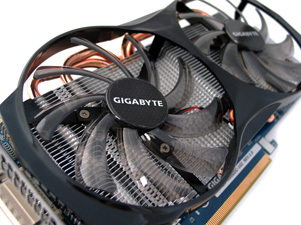 The third GeForce GTX 560 to come across our test bench is from GIGABYTE. 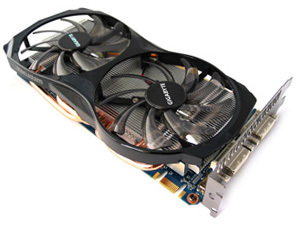 Rather than a simple copy and paste cooling solution from their previous GTX 560 Ti models, they have moved straight to new WINDFORCE 2X cooling solution, a compact PCB design and improved core and memory clock speeds. 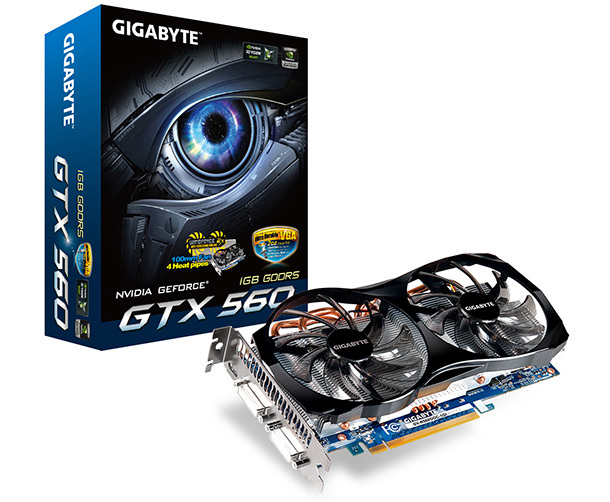 So, how much faster is it compared to a stock GTX 560, and what does GIGABYTE bring to the table with this GTX 560 OC edition? Let's get right into the review! 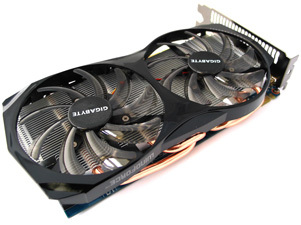 GIGABYTE's GeForce GTX 560 OC measures in at 221 millimetres in length (9.72 inches) including the fan shroud that extends past the PCB (PCB length 210mm). 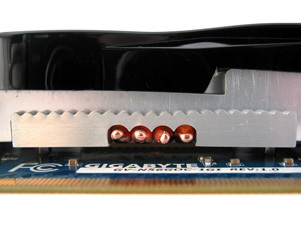 It's worth noting that this is the smallest of the three GTX 560 cards we've tested, which may be of interest to HTPC users. It requires a minimum of 500W or greater system power supply to keep it well fed. Cooling is provided by dual 100mm fans and a heatsink with four copper heat pipes and an aluminium fin array that allows for efficient heat transfer and dissipation from the NVIDIA GF114 core. While it does conform to a dual slot design with vents above the display connections, the vast majority of the heat will be dumped into the case, so good airflow is key to maintain cool operation. Inside the box we would normally find a user manual detailing installation, product features and general requirements of the video card, a software and driver disc for installation, and two 6-pin PCI-Express to Molex power converters, as well as a DVI to VGA converter and mini-HDMI to HDMI cable. But as we received this card before retail boxes were produced, we didn't get any goodies. But GIGABYTE have confirmed these are the accessories that will be included in the retail packages. Accessories may vary based on region of course. 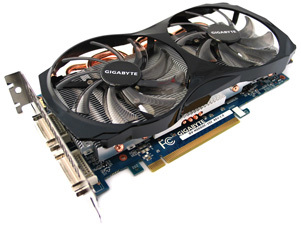 GIGABYTE's GeForce GTX 560 OC has maintained NVIDIA's default display connector configuration, as per the reference GeForce GTX 560. And as with the GTX 550 Ti and 560 Ti it features bit streaming support for both Dolby True HD and DTS-HD Master Audio, which is especially handy for home theatre PCs. 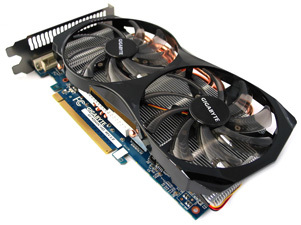 A unique technology featured on GIGABYTE's motherboards has come to graphics cards in the form of the Ultra Durable VGA technology banner. 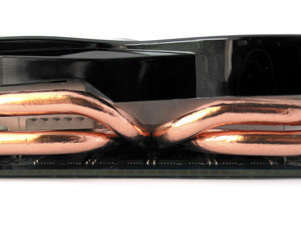 This includes a 2oz copper design for a lower working temperature and a reduction of hotspots, better overclocking and better power efficiency, as well as Japanese solid capacitors, Tier 1 memory from Samsung and Hynix, as well as quality Ferrite Core chokes and MOSFETs adding to the benefits of the 2oz copper design. 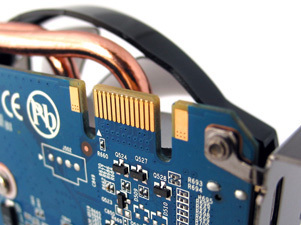 On the edge of the card we find a single SLI connector. Due to the mainstream nature of this card NVIDIA has limited its scaling abilities to two cards. Only the GTX 465, 470, 480, 570 and 580 allow for more than two cards in SLI. At the back end of the card there's a pair of PCI-Express 6-pin power connectors, which is a pretty standard configuration for a GTX 560 video card, not straying from the NVIDIA reference design. 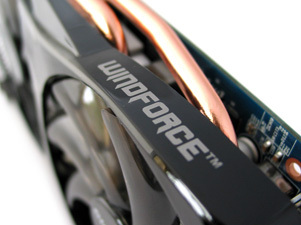 The cooling solution implemented with GIGABYTE's GeForce GTX 560 OC comes under the WINDFORCE 2X banner, with the 2X referring to the dual fans present in its design. While it's not uncommon to find GIGABYTE's WINDFORCE cooling solution on their non-reference designs, it's the first time we've encountered this specific design. And what makes this design so unique is the use of dual 100mm fans allowing for large amounts of air to be pushed through the aluminium heatsink array, fed by the quad heatpipes, with as little noise being produced as possible. 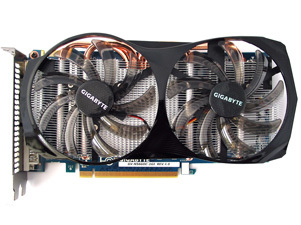 On the memory side, GIGABYTE's GeForce GTX 560 OC features Hynix H5GQ1H24AFR TC2 GDDR5 memory specified to run at 2500 MHz (5000 MHz GDDR5 effective) up to 1.5V. 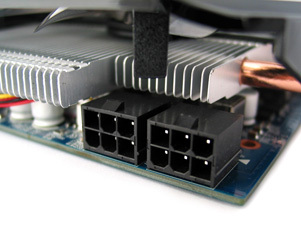 No heatsinks are provided to keep the memory cool apart from the airflow from the main heatsink; however critical power circuitry is covered by an aluminium heatsink.